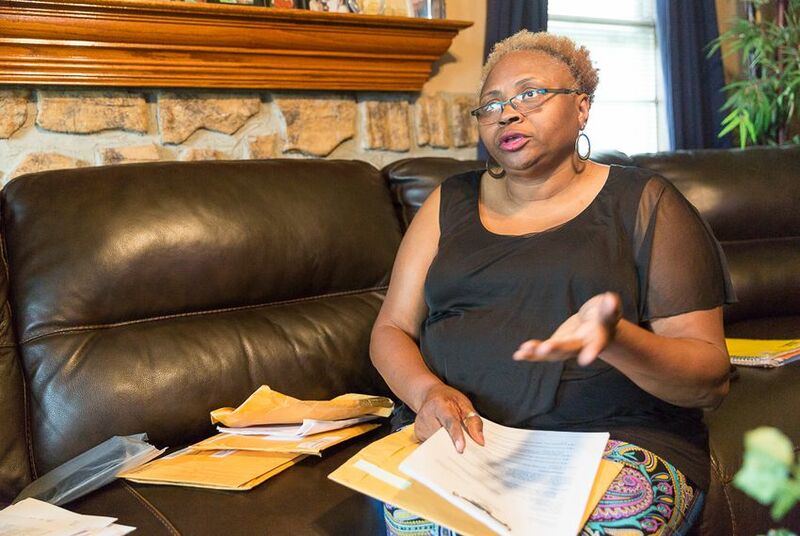 Texas to Injured Worker: "You Have Been Sued"
Teresa Hammond, who was injured on the job at a youth lock-up, thought she had won her more than two-year battle against the state’s workers' compensation insurer. But last month, the state sued her, leaving her scrambling to find help. CALDWELL — Teresa Hammond thought the final minutes of 2011 would pass quietly. Well into her 12-hour shift at Giddings State School, a rough-and-tumble youth lockup about an hour’s drive east of Austin, she saw a few kids still up watching TV, but most had gone to bed. “The kids, you know, had been fairly good,” the veteran officer recalled. But by midnight, her dorm had erupted into a full-fledged riot. Inmates leaped from their beds and raced across the grounds. One tried to cover a surveillance camera with grease. Some shoved sheets into toilets and watched them overflow. The showers and sinks flooded, too. Amid the chaos, Hammond, now 53, grabbed the shirt of one sprinting offender. His momentum nearly yanked her arm out of its socket and drove her left knee into the ground. Her injuries from that night — including a fractured knee and nerve damage in her shoulder and arm — left Hammond where she is now: cooped up at home in rural Burleson County, hobbling long after knee surgery and struggling to perform basic tasks like vacuuming and putting on clothes. In addition to being unemployed, the 20-year veteran of the state is suffering from another indignity, a lawsuit trying to recoup workers' compensation benefits. Hammond's position is rare but not unique. She is one of 80 injured state workers in the past decade that has been taken to court by Texas' Office of Risk Management after being awarded compensation from the state's Division of Workers' Compensation. The lawsuits are a last-ditch attempt by the risk management office to dispute a decision on worker benefits. In recent years, the state has seen fewer of those suits, which the agency says it files judiciously. But when such suits are filed, the odds are stacked against injured workers. That's because a recent Texas Supreme Court decision that exempts state agencies from paying attorneys' fees in such cases — even when they lose — makes it incredibly difficult for workers to find legal help. These days, Hammond, who was medically discharged by the Texas Juvenile Justice Department in June of 2012, relies mostly on others to get by. For the first time in her life, the single mother of two grown children is on food stamps. Occasionally she gets a check for overdue child support. She’s applying for federal disability benefits. So far, the risk management office — the obscure agency charged with insuring thousands of state employees when they are injured on the job — has paid most of her medical bills. But the agency has done so begrudgingly, contesting the extent of her injuries — and whether they all occurred on the job — at every possible point in a regulatory process critics say is far easier for insurers to navigate than injured workers. The agency argued it should only cover Hammond’s knee injury and shoulder “strain,” calling the nerve damage extending from her fingers to her shoulder “degenerative” — the result of natural processes unrelated to work. It also contests the date she reached “maximum medical improvement,” which is when an insurer can stop paying temporary income benefits because an employee's injury has healed as much as can be expected. By April of this year, Hammond, with the help of a state ombudsman, had declared victory. An administrative judge with the Division of Workers’ Compensation — which regulates the risk management office and all workers' compensation insurers in Texas — determined that the nerve injuries were “caused, enhanced, accelerated or worsened” by the New Year's riot. The judge also found that “the preponderance of evidence” supported a doctor’s decision that Hammond had reached "maximum medical improvement" on Jan. 15, 2014 — not nine months earlier, as the risk management office contended. The judge ordered the risk management office to pay benefits it had held back in protest. When an appeals panel upheld that decision in July, Hammond thought her battle was finally over. She was wrong. In late August, the risk management office filed suit in Burleson County, asking a district court to overturn the administrative judge's ruling. A courtroom win for the risk management office would make Hammond liable for court costs. If the agency is found to have overpaid benefits to Hammond, it would be allowed to recoup those dollars from a Texas Department of Insurance fund originally meant to help Texans who suffered multiple injuries on the job. Stephen Vollbrecht, the executive director of the risk management agency, said in an email that he cannot comment on Hammond’s case because of privacy laws and the fact that it's still in court. But he said the agency carefully considers the circumstances whenever contemplating such a suit. “We are authorized by law only to pay benefits to which an injured state employee is entitled under existing law,” he said. Such lawsuits by the risk management office are not common. It has sued 80 workers in similar cases since the beginning of 2005, according to records provided by the agency — a period in which it handled an average of 7,700 claims annually. And the number of suits has dwindled in recent years, though it’s not clear whether that’s due to the office merely pursuing fewer cases, or due to workers winning fewer cases at the administrative judge level. But the few defendants named in those courtroom suits face major obstacles in finding legal help. A 2012 Texas Supreme Court ruling offers a special perk to government insurers like the state’s risk management office: If those insurers sue a worker and lose, they do not have to pay the winner’s attorney fees. The agency’s “sovereign immunity” — a legal doctrine that makes a government entity immune from a civil suit or prosecution — exempts it from a law meant to discourage frivolous lawsuits against injured workers. That means lawyers representing workers in such cases often can’t get paid, and as a result, have little incentive to take on those clients. “It just breaks my heart,” said Kay Goggin, a Dallas-area workers' compensation and plaintiff’s attorney. “There’s no way for attorneys to get paid, and these are very expensive cases." This week, Hammond caught one break. Brad McClellan, a workers’ compensation appellate lawyer and former chief of the workers’ compensation section of the Texas attorney general’s office, agreed to take on her case for free. He is also defending workers in three other suits against the risk management office. Without that help, Hammond, who had struck out with several other lawyers, said she wouldn’t even know how to file a reply to the suit, due in court next Monday. McClellan learned about Hammond’s case when The Texas Tribune asked him to review it for this story. The state Supreme Court has a lot to do with that. In 2012, it sided with the self-insured Austin Independent School District, which argued that its sovereign immunity should prevent it from paying the roughly $53,000 legal bill of Charles Manbeck, an employee injured on the job while tightening a device that automatically closes doors. The school district had disputed the extent of Manbeck's injury before the state Division of Workers' Compensation and in court, and lost in both venues. “We must agree with AISD that it is immune from Manbeck’s claim for attorney fees,” the justices wrote, saying that a 2001 law requiring insurers to foot the legal bills of workers they sue unsuccessfully did not apply in this case. The opinion reversed a ruling from an appellate court. Critics say the ruling gives government insurers free reign to appeal decisions already hashed out in the complex Division of Workers' Compensation, often leaving workers with no representation. A measure in the last legislative session — House Bill 3166 — sought to end sovereign immunity claims in questions about attorney fees in workers' compensation cases, but it did not get a hearing in the House Committee on Business and Industry. Rep. Nicole Collier, the Fort Worth Democrat who sponsored the bill, did not respond to a request for comment for this story. Vollbrecht, the risk management office chief, says the Supreme Court decision plays no role in whether or not the agency files suit in district court. He points out that the agency has filed fewer suits in recent years, falling from 10 in 2011 to just one — Hammond’s — this year. In 2014, the state Division of Workers’ Compensation named the risk management office a “high performer” compared to other Texas insurance carriers based on a broad range of oversight data. The division said it could not find any record of fining the risk management office since 2007. But district judges have sanctioned the risk management office at least twice in the past decade for bringing frivolous lawsuits against workers. The agency disputed those sanctions, which appellate courts affirmed. Hammond says she’s thankful to have happened upon an attorney who will help her, but outraged that she has to gear up for another fight.